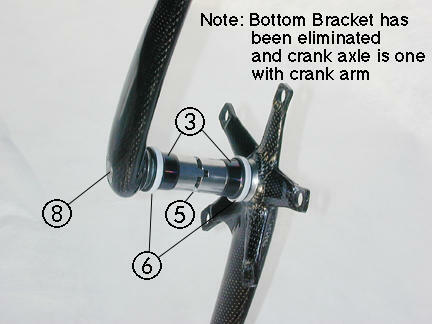 After the firsts Shimano 2007 news, some rumours about Campagnolo are spreading on the internet. It is said that Campagnolo cranksets will be totally redesigned for the next year. They’ll use a system similar to Shimano because of the external bearings but they will be ultra-narrow to lower the Q-Factor. The crank/bottom bracket is different than the Shimano in that the crank is 2 “L” shaped items that fit together mechnically in the center of the bottom bracket spindle. Still according to rumours, Campagnolo would be working closely with FRM and the first bikes equipped with the new cranksets would already be under tests on the road.